With the introduction of Tier4A engines, Cat engineers revamped the loaders to add many features. 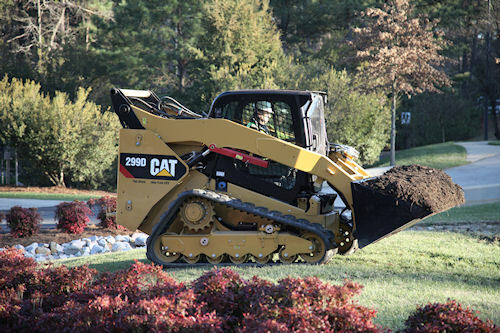 In a recent media introduction to a long line of new Caterpillar models for the building and construction trade, Cat officials noted they used the timing of new Tier4A engines in their "D-Model" skid loader and track loader lines to upgrade the machines well beyond just clean air. They also reached out to agriculture with the 272D XHP and 299D XHP, as worthy candidates for feedlots, dairies and other crop and livestock uses. The 110 hp. Cat 299D XHP track loader is also Tier4A rated and features such things as a sealed and pressurized cab, "intelligent leveling" software to provide for level loads in uneven terrain, and ride control through its torsion axle suspension. The results of the overhaul include the XHP models that boast 40 gallon per minute hydraulic systems, up from the 23 gpm rating of the 272D and 299D models. The boosted hydraulic power provides a working pressure of up to 4,061 psi, and a 94 horsepower hydraulic rating on both. Both new machines feature sealed and pressurized cabs, seat-mounted adjustable joystick controls and an air-ride operator seat. The engine is controlled by an electronic torque management system that allows lower rpm operation at load, and gives the operator a two-speed option for transport or close work. In addition, the new loaders have an industry exclusive electronic hand/foot throttle with decal pedal capability and "intelligent throttle" that prevents bucking and jumping in rough terrain that causes inadvertent foot pressure on the accelerator. (THROTTLE) . Other amenities include Cat's "Intelligent Leveling" system that keeps loads level in rough terrain, and allows the operator to lock in work tool positions and "return to dig" options. The 272D and 299D models share everything except the 40 gpm hydraulic system with their XHP counterparts.